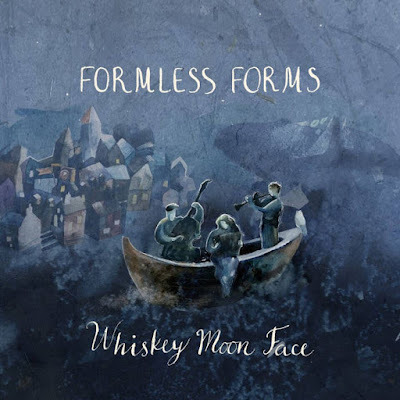 Formless Forms is the third CD from trio Whiskey Moon Face. Northumberland born Louisa Jones is the leader and she writes most of the songs. She studied ethnomusicology at SOAS (like fellow unclassifiable musician Nick Mulvey) and plays accordion, piano, double bass, cornet and clarinet. She was inspired to learn the accordion after staying with Celtic musicians in Ireland and she learned Drupad (a northern Indian classical vocal tradition) in Bhopal, India. American bass player “Dakota” Jim Ydstie (from North Dakota) originally came to London on tour with New Orleans clarinettist Dr Michael White. He then moved here to play with the Pasadena Roof Orchestra. Clarinettist Ewan Bleach, who arranges most of the songs, studied at the Guildhall, and plays and guests in a variety of bands, including New Orleans-based Tuba Skinny. The trio all play in each other’s bands too. Bleach leads the Cable Street Rag Band which features Jones on double bass, Ydstie on piano and trumpeter “Magic” Mike Henry from the Chris Barber Band (who plays on track 11 of this CD). Jones and Bleach play in the Dakota Jim Band, led by Ydstie (playing accordion), with Jones on double bass. Jones and Bleach are members of Man Overboard, until recently with classical violinist Thomas Gould. There are others too, no doubt. The music of Whiskey Moon Face is charming and difficult to categorise, with influences from all over, not surprising given the trio’s diverse musical backgrounds. I am reminded of many different musics. There are elements of contemporary Western folk music, Eastern European and Klezmer, traditional New Orleans jazz and Hot Club de Paris, especially when guitarist John Kelly joins in. Almost half the tunes are accordion driven waltzes (I love a waltz) from light as a feather Parisian bal-musette to full-blown brass-drenched Nino Rota melancholy. Whiskey Moon Face conjure up a world where velvet curtained European cabarets, New Orleans marching bands, travelling circus players and Russian tea-houses co-exist in a fantastical bohemian London. Jones writes likeable tunes, and her voice is delicate and yearning, with a lovely light vibrato perfectly suited to both the old-time jazz tunes and the cabaret songs. I can hear hints of Tom Waits’ harmonium in her accordion playing and her tunes. She has an arresting voice – at times it recalls Madeleine Peyroux, Billie Holiday and Björk. Ydstie contributes a wistful tune Renia’s Waltz on which he plays the accordion and sings, Jones takes the double bass and Bleach gives us an elegant clarinet solo. Bleach’s two instrumental compositions are also lovely. There’s a stately but optimistic waltz Karolina, the dignified melody carried by Maxim Tartakovskiy’s trombone, with Bleach’s beautiful clarinet circling round, and Jones and Ydstie underpinning the whole thing. Into The Heather begins like a dance tune from the 1920s, then slips into Klezmer rhythms, before concluding in a sort of contemporary Hot Jazz style but with something very British in there too, maybe a suggestion of Jim Parker’s Banana Blush? Jones’ songs are a wonderful jumble of styles. The Brecht/Weillian ballad Starlight Night describes a night stroll around Limehouse Basin, with musings on its maritime history, as well as providing Bleach with the opportunity to demonstrate his virtuosic bubbling and swooping clarinet. 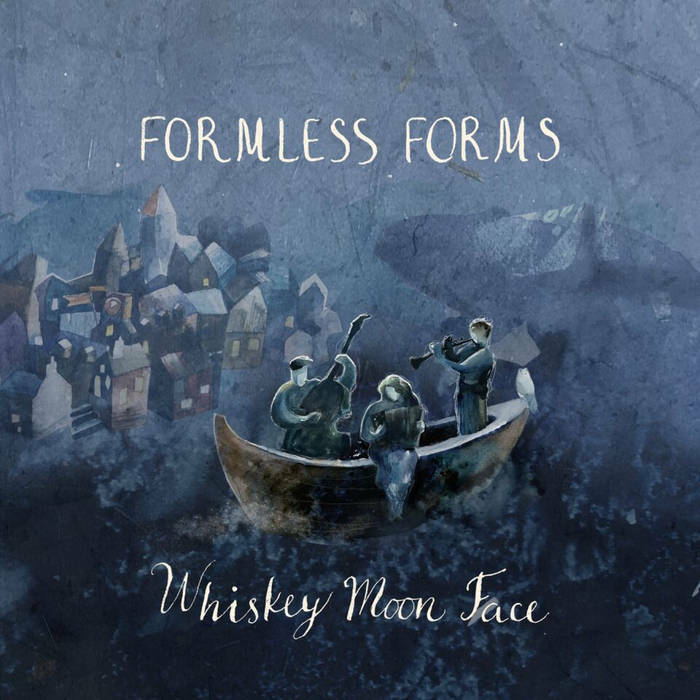 The title track Formless Forms, with Bleach on piano, and Will Scott on clarinet, sounds like New Orleans music from the 1920s and Jones’ voice is perfect for this too. The lyrics however are not of the “moon and June” variety – Jones manages to fit in “rubik cube” and “Hadron Collider” along with the moonlight. Distant Song is another sad waltz (yet with a suggestion of the lambada about it), with lovely ensemble playing. Dirty Fingernails is a rollicking Russian dance with lively solos from everyone, Cold Wave Crest has a beautiful melody, and Jones singing touchingly “Oh love hide me down/Under the ocean bed/And in dreams I’ll be with you”. In Russian Waltz, Jones sings in Russian – a translation is provided in the accompanying booklet. Some of the songs are catchy dance tunes. It took me a while to notice that there is no percussion – the tracks are beautifully rhythmic without any need for drums. The Formless Forms CD is a delight. I have had the good fortune to hear these musicians live, and I can recommend going to see them too, if you get the chance. Their shows are life-affirming, with make-you-grin dance music mixed in with the poignant ballads. Fortunately the band perform often in London.